Even though it doesn’t always feel like it, the country has officially been out of recession for three years now. And while government statistics tell us that a recovery is under way, many Georgia communities are still struggling to reignite healthy growth in the aftermath of the Great Recession. All of this makes what’s happening in Polk County even more remarkable. The recession was little more than a speed bump in Polk, county leaders say. According to Eric McDonald, president of the Develop-ment Authority of Polk County, Polk has lost only one employer of significant size since the recession began. “Every other one of our top 10 employers has expanded,” says McDonald. Most significantly, Rockmart-based Meggitt Polymers & Composites, which manufactures aircraft fuel tanks and is the county’s largest employer, has doubled in size over the past five years, growing from about 600 employees to more than 1,200. “And they recently announced plans for more growth that will add another 56 new jobs in Rockmart,” says McDonald, adding that Meggitt was recognized by the Technical College System of Georgia and the Georgia Department of Economic Development as the Large Manufacturer of the Year in 2011. Convenient, low-cost transportation is critical for any region’s economic development, and Polk County benefits from a strategic location right in the middle of a southeastern triangle of industrial centers: 50 miles from Atlanta, 85 miles from Birmingham, Ala., and 83 miles from Chattanooga, Tenn.
“Our proximity to these three cities makes us very attractive to industry,” says Roger Waldrop, chairman of the Development Authority of Polk County. Interstates 20 and 75 are quickly accessible from Polk County via four-lane highways U.S. 27 and U.S. 278, which run right through the heart of Polk County. Manufacturing is the county’s larg-est industry, with The HON Company (furniture), Jefferson Southern Corpor-ation (auto parts), Can Am Yarns (yarn) and Advance Storage Products (storage systems) joining Meggitt on the county’s list of top 10 employers. Aerospace, healthcare and telecommunications are other key industries – AT&T, for example, operates a 424-employee call center in Cedartown. In addition, Polk Medical Center – a new state-of-the-art, 25-bed critical access hospital – will break ground between Rockmart and Cedartown by the end of this year. “This is a $25-million investment that will bring about 30 new healthcare jobs to the county, mostly in surgical nursing,” says McDonald. A medical office building and medical mall are also planned for the campus, which is projected to be complete by January 2016. Two publicly owned industrial parks are located in Rockmart and Cedartown, encompassing 298 acres of prime industrial land. The Cedartown North Business Park has 115 acres of light industrial land just off the U.S. 27 bypass, only one mile from U.S. 278. An additional 220 acres have been purchased by the Development Authority of Polk County adjacent to the park’s eastern boundary. The Rockmart 101 Business Park contains an additional 183 acres of industrial land. Jefferson Southern Corporation (250,000 square feet) and Nordic Logistics & Warehousing (300,000 square feet) are the largest occupants of this dual-rail park, which is served by both Norfolk Southern and CSX. The economic health and vitality of Polk County isn’t something that happened by accident. 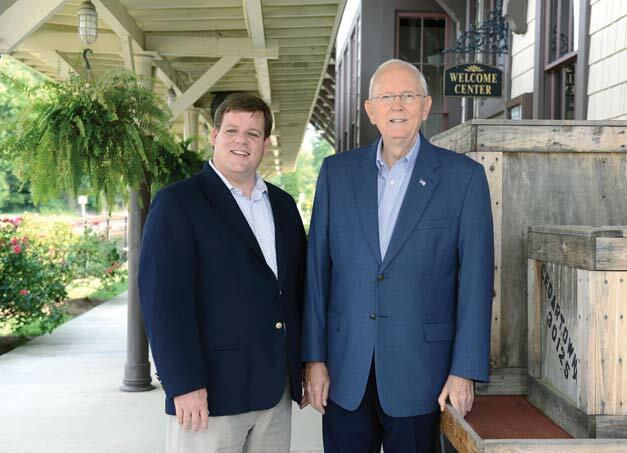 According to Rockmart City Manager Jeff Ellis, officials from the county and from both Cedartown and Rockmart have been working together closely to keep economic development on track. You might be surprised to learn about the impact of tourism on the Polk County economy, given the county’s relatively rural and somewhat off-the-beaten-path location. But Polk Tourism Committee Chairperson Jean Laltrello ticks off the list of popular tourist attractions in Polk County, starting with the Silver Comet Trail (see sidebar at right). For thrill seekers, there are two skydiving operations located between Rockmart and Cedartown, and the 1,000-acre Highland Park Resort is rated as the best ATV park in the southeast and the No. 1 ATV park in Georgia, offering riders 45 miles of one-way ATV trails. Cedartown and Rockmart also both feature quaint historic downtowns that are testaments to Southern charm and hospitality. Dr. Tommy Engram, Cedar-town’s redevelopment director, says that Cedartown is a Department of Community Affairs-designated Main Street City that’s following a carefully designed plan for development, including $1.6 million that was recently invested in new downtown streetscaping. College Street lies at the center of historic downtown Cedartown, surrounded by turn-of-the-century architecture, trendy clothing boutiques, antiques stores and unique restaurants that welcome tourists. The city has put together an attractive incentive package that includes both county and city enterprise zones that will double a restaurant’s property tax relief and opportunity zone tax credits worth up to $3,500 per new employee, according to Engram. “It’s a great opportunity to open a niche restaurant in a beautiful, historic Southern downtown,” adds Cedartown City Manager Robbie Rokovitz. Even though some empty storefronts remain on Highway 27 heading into downtown Cedartown and in the downtown district itself, the city is being very selective about the kinds of businesses that will occupy them. Remember in the Pixar movie Cars how the main characters tried to figure out how to get drivers to hop off the main freeway and take a detour through the small town of Radiator Springs? In their efforts to boost tourism, Laltrello says that the county conducted research to determine why drivers jump off Highway 27 and who these drivers are. While Cedartown and Rockmart are well-known adversaries on the football field, baseball diamond and basketball court, this spirit of competition doesn’t extend to economic development. In fact, it’s just the opposite, says Rockmart’s Ellis. A big part of meeting the workforce challenge, of course, is education, and Polk County offers convenient access to six different institutions of higher learning, starting with the Georgia Northwestern Technical College campus in Rock-mart. The college offers the Quick Start program that provides customized training to students to prepare them to work in new and expanding industries at no cost to the business. “This is a great selling point for businesses considering relocating here,” says Waldrop. Working together with The HON Company and the Polk County School District, Coosa Valley Technical Institute has also created Project Success, a program launching this fall that will give 30 at-risk high school students a job that will help prepare them for a career after they graduate. In addition, Southern Company and Georgia Power have partnered with the Georgia Northwestern Technical College to create the Instrumentation and Controls Academy in Polk County, which trains 32 people every year for high-tech jobs in the power generation industry. “Two years after high school graduation, a student with this training can earn up to $60,000 a year,” says McDonald. The county’s commitment to economic development is evidenced by a Special Purpose Local Option Sales Tax (SPLOST) that was first passed in 2008 and then renewed last year through 2018. In addition, $165,000 was recently approved by the Polk County Commission for infrastructure improvements to help existing industries in the county continue to expand.